In keeping with the mission of Florida Atlantic University, our goal is to provide students with both academic and personal development, discovery, lifelong learning, and public engagement. Our program prepares students to think critically about the ways that gender and sexuality interacts with politics, culture, ideologies, social structures, and economics, historically and globally to shape the lives of women and men. Our courses explore gender and sexuality through experiences and standpoints rooted in a diversity of intersecting factors, including class, race, ethnicity, nationality, ability, religion, and age. Women, Gender and Sexuality Studies at FAU developed out of the concerted activism of faculty, students, and members of the greater community and we continue to support this tradition. We encourage students to see themselves as being able to make a difference for social justice in their own lives and in the lives of others around the world. If you would like additional information, please phone our office at 561-297-3865 send an e-mail to wsc@fau.edu, or click on one of our links. We look forward to telling you more about our program. Dr. Josephine Beoku-Betts on Graduation Day with MA in Women's Studies Students. 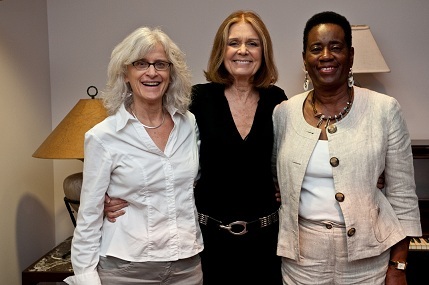 Gloria Steinem visits Florida Atlantic University.